I had a client recently call me and one of her main Excel files that was stored on the server was crashing, locking up, and generally being obnoxious. There have been many versions of Excel, starting with Office 95, thru the newest version Excel 2013. This would apply to any version of Excel. For the most part, Excel problems are caused by improperly closing the file. 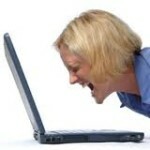 When a file, database, .pst or .ost email database, or generally any file isn’t closed gracefully, it causes issues. This is exaggerated when the file is stored on a server, and many times that file will be opened by more than one person. At times, at the same time. Which gives you a message that the file is already open. If you have a file acting up, one way to remedy this is to start a new file. Chances are your not going to be able to fix the one that has become corrupt. There are some scan tools out there that attempt to repair Excel files. I haven’t had much luck with these tools, and there’s a chance when you download “Free” programs, they really aren’t free. Spyware, Malware and other nasties often piggyback on free downloads. Don’t take the chance. Start a new file. Since many large Excel files in the enterprise have tons of accounting, formulas, object tracking, and other data in them, many times you never really know how old the files is, what the original version of Excel it was generated in, whether it started life as a .xml standard file, etc. Start a new file, cut and paste each page into the new file, cleanup any unneeded data, and you should be good to go. That is if you can get the files to open and cut and paste out of it. If not, try copying it from the server to your machine locally, if it’s not there already. You can also give “Autorecover” a shot as my friend in the picture refers to. Autorecover is a built in function in the later versions of Office that saves a copy of your file every few minutes. 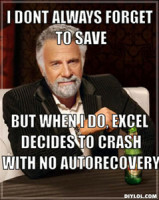 Chances are you have seen a tab on the left of Excel stating “Autorecover has saved a version of this file”. Just find that version of the file and see if it will open. If Excel acts up on ANY file you open, it could be you have a problem in the Office suite. If that’s the case, go to control panel, add-remove programs, or whatever depending on your Windows version, and try a repair of Office by highlighting Office in the list, click change, and select repair. Then try your file and see if it’s fixed. You may also have an add-in that is causing the problem. Another troubleshooting task would be to disable any add-ins in Excel from the add-in configuration page under options. If you have any macros running, try disabling them and see if that helps. As a last resort, contact your system administrator and have them do a restore of the file from when the file was ok. You may also be able to try this yourself by right clicking on the file, and see if there is a tab called “Other versions” This is the VSS copy of the file that Windows, if correctly configured, has saved for you. Good Luck and Happy Excel-ing! Have Outlook 2010 Authentication Problems on an Office 365 Machine? Is your computer’s Outlook 2010 refusing to authenticate or won’t save your password when trying to connect to Office365? There is a Microsoft patch for that. The patch is kb2553248 and links from here…http://www.microsoft.com/en-us/download/details.aspx?id=29361. This week, I had one computer that just wouldn’t authenticate after an autodiscovery setup Outlook 2010 that gave all green checkmarks. It said: “You must restart Outlook”. When I did, it wouldn’t accept the password. So I ran the patch above and it worked as designed. Problem solved. I believe this patch comes down in Office SP2. But for some reason, even though Windows Update said no updates available, this one fixed the issue instantly. I hope this saves someone else the 5 hours it took me to find the glitch in M/$ and Office 365. Tally-Ho! !